Starring, for the first time: MAGIC!!!!!! First EVER Video of Magic. For those who are here for the first time, Magic is an F1 Bengal, which means his Daddy was an Asian Leopard Cat. He was bounced from home to home for BEING an early generation Bengal, and finally ended up with us in rescue. He now has a home with me, and for the first time, is coming out when another person is in the room, for some play. (He hid in his cave for months after I got him) He has gone from a hostile being who trusted to no one and nothing, to a Kitty who knows how to love. And Play. Early Generation Bengals take a lot of special care. They are closer to the ALC (Asian Leopard Cat) If you decide to adopt a Bengal thru Great Lakes Bengal Rescue or another rescue, you will not be getting an early generation Kitty. You will be getting an F4 (considered a domestic cat) or higher. They have all the spots, energy, and intelligence and beauty of their earlier Gen cousins, but without the problems sometimes associated with the Early Gen guys. 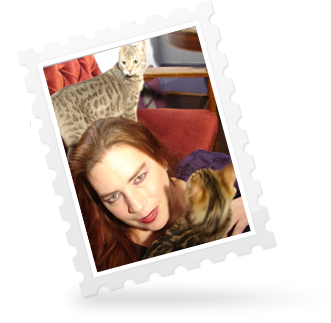 EG Kitties need to be with people who know what they are getting, AND what they are doing once they have them. If you understand Bengals (And I am happy to help, point you at websites, talk, anything) pretty much any cat lover will do just fine with a Bengal. They have a way of getting into your heart. It was our own Cat Mihos (Kitty, @neverwear, @furrytigerkitty) Boss's other Assistant and my dear friend who took these, first ever Magic vids. They make me nearly cry, thinking how far Magic has come. No one wanted him. He loved no one, and no one loved him. He ended up at a shelter who would not take him, because he was not adoptable. He had no chance they said. Oh my god, Lorraine!!! Those are amazing! You are so incredible to have saved this amazing boy. I love love love Magic and I love what you've done for him! It makes me so happy to see these vids, I can't even tell you. Thank you Q and Thank you Kitty! He's such a gorgeous boy! And so curious, and looked like he was having FUN!! oops, forgot a ticky box. Also, Magic so reminds me of my Tonks with that white underchin and bewildered expression at all times. So lovely - and he looked like he was concentrating very hard on that feather! You do amazing work with these cats. wait til you see the ones of the Royals! just got back from AMAZING firewoks stand with NonBirding Bill and Woodsman Hansy, i got my own fireworks license....i will video tonight...kaBOOM!!!! Gorgeous gorgeous. That was wonderful to see. You have done such good work with that boy.Magic indeed! It's so cool, Lorraine, that you got Magic to the point where he's okay with ANYone else. Even cooler that he feels whatever enough with Kitty to play with her in the room. Brava! Amazing and beautiful, not only the cat, but what you have done with and for him. Magic! Playing! What a joy to see. Yay Magic! Get that feather! Thanks you all! It does make me happy. He was so alone, not sure I ever saw a being so alone. And now he has me. And Mim kind of. She likes to go on his porch. She bullies him horribly. He likes it. I am putting a Scream door on his bedroom, so he can look into the Romance room a at us, since it will be too cold soon for his porch. My heart hurts with happiness. Lorraine, you are truly awesome and full of win. To see Magic out and playing and being filmed, really, I am breathless. So very cool. What a beautiful comfortable boy Magic has become! And this was the cat in full hiss and fur fluff mode high on a shelf telling everyone to back up and out or be sorry. Many happy hearts here today (mine included). I cannot watch Magic here in the library but once I get home I will! Just finished up work. You know, I never get to spend time with cats of any kind ... unless I happen to be with a friend who has cats, but my mother is so allergic and just does not like cats. this warms my heart. this is so full of awesome. So wonderful to see Magic playing. Happy boy. I just watched the videos. Magic looks like he's having so much fun. Just had my first proper conversation in Chinese. I have never actually had a proper conversation - I've had times where I've frozen up, sputtered, "What? What?" in Chinese, and had to revert to English (since the conversation partner was usually bilingual), but not today. could this be the next trick for Venus to learn? Oh, Sally...I have tears in my eyes from laughing. I have been that cat. Jack says: "I'll do it tomorrow, I promise!" O the wonderful logic of twelve-year-old boys. Stop, stop, I can't breathe! Oh Sally, that is hilarious! They are all ever so wonderful! And you two are so wonderful together! No being is hopeless, as you have proven with your beautiful Magic. Such a cutie, he is. It does my heart good to see him playing like a kitten. That's so wonderful to see!thank you both so much for sharing. And I hope the party was great, too. Seems to be still going. Very fun! Yay for fun times with good friends! It sure sounds like a wonderful night. Today I take Mum to see Richard III. I enjoyed this production of it so much when I went with a friend a couple of months ago, I offered it to Mum as an alternative to an opera this season. She chose the play. She was practically bouncing last night in anticipation. Calvin is home, looking thin but seeming better. Oddly enough, craving attention after his 2 days away. I love fireworks - will there be photos of the party? I saw the preparty shots. Looks like Magic what a little shy of the camera? But a whole new being now, he is. I had a similar thought as Cecily - shows that so many beings must have a future no one thinks likely for them, if someone will simply give them the space and time to become. Look what you've done for both Magic and Luka! Helped them find their names. Helped them live. Good to hear Calvin is home. *scritches* for the kitty. Happy birthday to Mr. Jess. ohhh, happy birthday Mr Jess. If all the clocks in the house are showing a different time, which one do you believe? Happy Birthday Mr Jess - you are the one with the lovely long hair, right? Sally, believe the one that is right, of course. Happy, happy firbday Mr. Jess! Sally, I'd go with the one that tells you it's cocktail time. Many many thanks for the firbday wishes! I spent the day not having to drive in Pittsburgh which is a real treat for me. Yes, that's me with the hair. Quite the weekend. Want to go home and sleep now. Until at least, er, morning. I remember the hair, the really lovely long hair and SCIENCE shirt. I never noticed, in all Magic's pictures, that white tip of his tail. Gorgeous kitty. Hardly believe he could ever have been so afraid. Great video, Sally. I did that to a printer just last week. I didn't fall out of the chair, but it's only a matter of time due to positioning of the printer facing the wall as it won't go any other way. I know cats are the main rescue focus here, but I was just reading about a greyhound track in WI that's looking to find homes for a lot of their dogs. It's not a euthanasia situation, but here's the link: http://tiny.cc/greyhound347. Hey Fiends. I had a lovely afternoon at the semi-fiend-formerly-known-as-Laser-Lady's lovely local jewelry artist party, which featured Feind Ellyn and two women who do some interesting metal work. Good stuff! Glad to hear that Calvin is feeling better. Not only my Mom's keyboard was French but her computer did not offer me the ticky box option either. Oh dear, Natalaw, have you begun to shamble?! Long weekend. I worked a lot, after weeks of the same. Listening to Norah Jones while finishing up an assignment tonight (and popping in here, hee) and there's a new picture on my desktop of some dear friends from Austin who gathered Friday for fun (without meeeee), and now I am feeling sooooo homesick for Austin, and the States - how can it be Thanksgiving when I have no chance of hearing that awesome Waitresses song on the radio? Right. Must be time for sleep. Hugs to you all, whatever easy or difficult things you're rolling with this week. Brain spices! I have none. Good morning. Okay. So it's the Holly-Daze, yeah? Who wants to do cards? I have cards; one could be yours, with a special, mostly illegible personal greeting written in. No chance of that, Marjorie. I shall be on the road again tomorrow (just for one day, in principle), again to Paris. I also have no brain spices, but only when I go to work. I shake them all out then let them regenerate, which is always somewhat harried on every other Monday, when they have about an hour to regenerate after work before I get to a city council meeting to cover it for the local paper. In other news, I was super stressed this weekend due to my potential move, but my mom and her husband (mainly her husband) are really supporting me and helping me get my New Orleans dream apartment, so today I am about 50 percent less stress than I was at this time yesterday. Well this is feeling darned early in the morning. Kitty leaves today, sadly. Some nonsense about seeing her Love before he goes off on tour. Hmmph. When she could be watching SUV with ME???? Good Morning Q, Good Morning Kitty, and save travels. *ahem* that should be safe travels. And I don't even have the excuse of it being early in the morning, becasue it isn't, here. Lorraine, you said that these videos nearly made you cry. Well, I accomplished the crying on your behalf, sitting here with tears streaming down my cheeks, watching this scared little guy find his wings. I have a ridiculously soft spot in my heart for misfits. I can't watch "Rudolph the Red-Nosed Reindeer" without sobbing. Thank you for loving Magic enough to help him find joy. May you be blessed tenfold in this life and whatever life may follow. I survived, and nobody was hungry. Details later. And also I will watch the videos later, I just wanted to get a ticky box in. Vampi - yays! Email me. Jess, i want a magic illegible card! yes, i go away today, am sitting across table from a giggling Quiche who reads Boss' not-so-funny story, wondering what she giggles at...but i daren't ask her. not while she is reading..
it is super sunny here, all this talk of rain and snow is merely that, talk. he may be gone til august!! Oh, and yes, I must have cards!!!!!!!!! Note to self: Somehow construct horrifying Hannukwanzmas cards. Well I can arrange that, Cat! Though I cannot promise the card will be magic. Unless you know card tricks. Badum tish. I presume the address is the Neverwear one, yep? I am truly abysmal at sending out cards. No really. About every 3 years I get excited by the idea, but the other years nothing is ever mailed. Purchased, sometimes, but never sent. But, given the rarity of responses, if anyone really still wants to send me something, my address is Sarah Goslee, PO Box 10908, State College PA 16805. I'm having a break: more coffee, and leftover coffeecake from yesterday's breakfast. Yum! I've been at work long enough to discover that my hands still smell of garlic, to get through all of my email and assorted correspondence, and to realize that the big project I was working on last week still is not going correctly. How about a picture of steak? No. Need meat. Xmas meat. Holiday meat. Leopards do not eat art. I'm going to be here for another month, so I'll post my address in case anyone wants to mail me random things, like shennanigans. Although, any mangoes will be forwarded to FabLo. If any of you internet lurkers were planning on murdering me and wearing my skin as clothes, you'd better hurry, because my new apartment includes security, seven flights of stairs, and 600 miles between me and the previous address. if all goes as planned, cards will be sent out this week. Care + Respect + Love = Magic(al) Progress. Wonderful how well he's doing now that he's not so alone. Tonight I leave for the Grand Thanksgiving Visit To Ohio. There will be food and people and dancing. NO ONE ELSE GETS STEAK!!!!! !I NEED IT ALL AND MORE THAN YOU DO!!!!!! You may have bacon tho. I strongly suspect that Freaky Venus has hijacked Q's computer. From piano keyboard mastery to computer keyboard mastery in just a few days! We should all be very afraid. Mushrooms are fine. You may keep those. So, "Quiche" how do you,I mean the cats, like their steak? I don't eat it myself, but they like it rare. Or well done. Or medium. Someitmes, medium rare, or medium well. Often raw too, a little tartar as it were. December will be a better month than November. Right? So. I guess I need to write some emails if I want to exchange holiday cards. I'll try to do that in the next couple of days. Seren is home with bronchitis. I guess it's a good thing that she and Ariane only have two days of school this week due to Thanksgiving. Obviously, I have very little today as I hit the "publish comment" button twice. i'll send you one Marjorie:) email me address: vampiress at gmail dot com or facebook, when it decided to have less fail. I like mail :) and i'm happy to card swap with any fiend. Sadly can't do cards..too busy. Only here on 10 minute break from Evil Paper Writing. I sent you a LOLBoss Q, did you get it? Oh! I love it. Thanks so much for sharing the kittyvids. Did get it Kali! Just very behind on answering e-mails. Steak schmeak. Pork is the meat of kings. NO PIGS!!!!!! I HATE PIGS!!!!!! Quiche doesn't dig on swine. I don't hat peeps, I just feel an obligation to rid the world of their evil. It's like, my job , ya know? They don't taste very good, either. I salute your efforts. Thinly sliced salty pig is good. Pig parts made into sausages are good. Peeps aren't good no matter what. I finally started making holiday season cars on Sunday...got a bit of a shock when I realized its December next week....eek. what happened to my good intentions to get them out early? Sally, tell us more about the Holiday Season Cars in Australia...You decorate them??? When whole pork loins are $1.00/lb at the grocery store, and you're not vegetarian or vegan, you eat pig. Pork is often cheaper than beef, even in Texas. you better believe it Quiche!!!! I should also add that you eat pork if you have no religious restraints, as well as not being vegetarian or vegan. I agree about peeps though, they are the Evil that should not spread. And they taste bad. But when they dry out enough and you throw them, they explode on contact, which is very satisfying. Wildly off the pigs/pork related topic, but anyhoo...I just realised I hadn't commented on the wondrous new hair. And Lorraine's fabulous work with Magic. All very, very beautiful. And...I've just spent an afternoon typing up other people's speeches, so now I've run out of words myself. Must be time to go home then! I wondered why I seemed to have missed some comments...damned inbox! Jess, damn, you missed out on my twitter collection of addresses earlier this month. Have I missed anyone else? you can email me at the address in my profile! Even if you think I know it, because things get lost. Especially addresses. I will happily receive cards, but do not send them, having done some in-side-my-head cleaning out of guilt triggers years ago, and finding that the whole process (buying cards, collecting addresses, and then failing to send anything) was a major cause of hating myself. Gave that up! So, if generous fiends don't mind no return card, I am Katie Hynes, 853 Hollow Rd, Phoenixville, PA 19460. And, Venus, get yer paws off that computer RIGHT NOW. I should have said what Dabbler said about it being ok to send me cards if any generous folks should so be inclined, but brain was too full of Art History paper to function properly. :P Thankfully it is ALL DONE and I'm turning it in soon. Have a nice blog rolling around in my head, but e-mail ate my morning after I got the Mads to school, and get this, I am meeting FRIENDS for breakfast before going riding with them! I'll write it later this afternoon, and post some more Bengal Vids. Dabbler, did the same thing in my head with the entire Xmas season years ago, what you said set me off, writing wise. I will teach you all How To Have A Great Holiday, and perhaps give you Wisdom and Insight, changing your lives forever. Or maybe just entertain you, which works too. We shall sit at your feet to await the pearls of wisdom dropping from your mouth/pen/keyboard, O Mistress. Enjoy your breakfast & ride with Friends. Friends for breakfast is the best sort of breakfast! Erm. There are many ways one might interpret a sentence like that, aren't there. I mean it in a non-cannibalist sense. Barely have any tea in me! Couldn't be helped. I like sending cards. It makes me feel cheery. I try to send cards. I really do...and I try not to stress over it as well. We do the family photo card now--ever since ben came into this world. But we don't do Sears portrait studio! Our cousin comes down and takes pics. We just did them sunday, the backdrops are stunning, we went down to the cliffs at the ocean by these cool, gnarly trees. Having said that, I pretty much only get cards out to the folks who expect them and the rest are bonus if they even happen. We leave tomorrow to go mushroom hunting in Mendocino. It takes so much packing! Rain gear, food, knives, etc etc etc. We have to not only be prepared to crawl through the woods and find the little shroomies, we have to be prepared to cook and eat them...and also have backup food just in case we find nuthin'. I'm procrastinating by writing this novel. I WANT to be one of those people who sends cards.....I really do. I probably have five or six sad, unopened boxes of cards from various years. I'll be too late for Christmas so I tell myself they will be New Year cards. By the time they'd be Groundhog Day cards I've usually given up. Dabbler is right....I need to break this cycle! I love holiday cards. I love sending them and receiving them. Sadly the past few years sending has just not been an option. As a result I get less. But this is okay. Someday I will again have time and money this time of year. Maybe this year I'll come up with some sort of email holiday greeting. I figured out that part of why I felt sooooo tired yesterday was that we were under an air quality warning. Today too but there is less haze in the air today. Yay for breakfast with friends then riding with friends. This horse thing is life changing I think! Why I hate Xmas and how to survive it blog is going to have to wait. Just bought myself a horse. No, no punch line. Bought a horse. Wow. Do you ever know how to celebrate a day (or half-day) off! Illicit Affair is lucky to get you. Hm. Well then. Horse blog it is. Wow. Your own horse! that is yours! That is so cool! Lucky horse, to have you! Now, which room is he going in to, and does he get a screamed porch, too? I suppose that would be Illicit Affair, your horsey Romeo? Are you going to train him to eat steak like the rest of your critters? Riiight. Off to bed with me. Nathalie - a good laugh thinking of the fighting for food scene. Wonderful news about Illicit Affair!! I love the idea of him on the kitchen counters with the Bengals. New new horse blog is UP!!! And I am over the moon!